Search Results | "wende weinberg"
(clockwise from front) Wende Weinberg’s sister Debbe Waterman Katz, Larry Elkus, Jefry Weinberg, and Laureen Waterman carried the chuppah while Steve Berman carried Wende’s Torah down Parker Road in Plano. More than 300 people made the journey from the Weinberg’s home, to Anshai Torah, where another 200-plus Anshai friends and family members awaited the Torah’s arrival. “This isn’t just an ordinary day,” Congregation Anshai Torah’s Rabbi Stefan Weinberg said, and April 15 wasn’t, as the congregation welcomed its Project 613 Torah, dedicated to its beloved Wende Weinberg, of blessed memory. More than 70 percent of Anshai Torah’s membership, as well as members of the community at large, participated in the Torah’s writing. Fulfilling the 613th commandment, young and old felt the touch of the quill, the touch of the sofer (scribe). “I’ve worked with many congregations in the past 25 years, and at Anshai I experienced something special,” said the sofer, Rabbi Zerach Greenfield. The Torah’s cover is embroidered “Hanoch l’naar al pi darko” (educate a child in such a way that he or she will thrive). 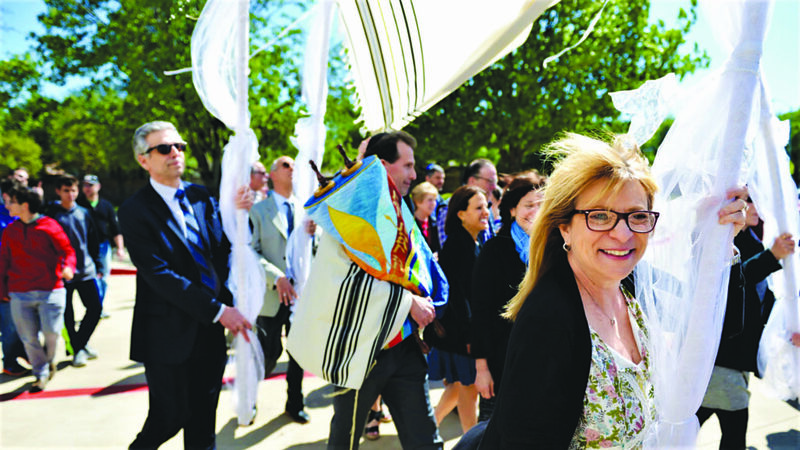 The journey to the ark was made by hundreds, with Steve and Judy Berman, Larry Elkus, Debbe Katz, Lauren Levin, Bruce Waterman, Laureen Waterman, Alla and Jefry Weinberg, and Marcy and Sandy Wohlstadter carrying the chuppah and the Torah. Once arrived, Michael Pincus served as master of ceremonies. Anshai Torah’s past presidents, Harry Benson, Richard Berry, Andy Cohen, Rusty Cooper, Andrew Farkas, Barney Goldberg, Debbie Katz, Philip Leibowitz, Michelle Meiches, Cindy Moskowitz, Howard Rubin, Warren Rubin, Neil Rubinstein, Josh Socolof, David Stanley and Carl Uretsky, led the next steps of the procession. Gerry Romanik, escorted by Noah Feldman, Janet and Robert Behringer, Dot and Basil Haymann, and Nicole and Michael Roy, carried in Anshai Torah’s existing Torahs, while Levi and Nadav Kushnick brought in the Torah’s crowns. With the grace and strength of their mother, Adina and Jordana Weinberg carried in Wende’s Torah under a chuppah carried by Marcy Kahn, Jay Post, Andrew Silver. 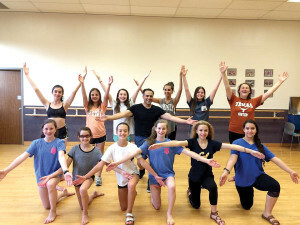 Barrett Stern and David Balis, and Alisa and Shayna Rubinstein served as Hagba’ah and G’lilah, lifted and dressed the Torah, as the Levine Academy Show Choir and Anshai Torah’s a cappella choir Kol Rina sang. Eli Davidsohn’s musical ruach provided the backdrop for hearts bursting in song, dance and pure joy. “From inception, our goal was to get as many people to participate in writing this Torah as possible and as we looked into the crowd of over 500, we knew that we succeeded,” said Nicole Post, who co-chaired Project 613 with Pam Goldminz. The committee also included Mojgan and Farzin Bakhshian, Jaime and Michael Cohen, Jonathan Goldminz, Jeanette and Michael Pincus, Jay Post and 72 honorary co-chairs. Post and Goldminz joined Greenfield, Marcy Kahn, Gerry Romanik and Weinberg in sharing their hearts, memories and blessings on the occasion. “This experience will have a lasting impact on us as a committee, and Anshai Torah as a congregation,” said Post. It was as though her blessings truly reached the heavens — and delivered right back. Rabbi Zerach Greenfield became the agent of the families of Rabbi Stefan Weinberg, Rabbi Michael Kushnick and Gabbai Farzin Bakhshian on Sept. 10, when he was blessed to fulfill the mitzvah of writing Congregation Anshai Torah’s first Project 613 congregational Torah. The community is invited to celebrate the Torah’s completion and dedication from 4-6:30 p.m., Sunday, April 15, at Congregation Anshai Torah, 5501 Parker Road in Plano. 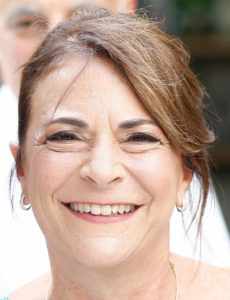 There will be dancing in the streets and spirit in the air from 4-6:30 p.m. Sunday, April 15, when Congregation Anshai Torah welcomes home its first congregational Torah, Project 613, a gift written by the community, to honor Wende Weinberg, of blessed memory. A procession with the Torah, to its home in the sanctuary’s ark, will be followed by the dedication and refreshments. Since last fall, members of the congregation and the greater Jewish community have participated by donating words, verses, chapters and books of the Torah in the name of Wende, who served as rebbetzin since Anshai Torah’s inception. She was a religious school teacher and principal, and for 32 years a teacher of Judaic studies and program coordinator at the Ann and Nate Levine Academy. On Sept. 10 Rabbi Zerach Greenfield became the agent of the families of Rabbi Stefan Weinberg, Rabbi Michael Kushnick and Gabbai Farzin Bakhshian — the first blessed with the honor to fulfill the mitzvah of writing Congregation Anshai Torah’s first Project 613 congregational Torah. “B’shem kedushat Sefer Torah…” It is a commandment for each Jew to write a Torah. 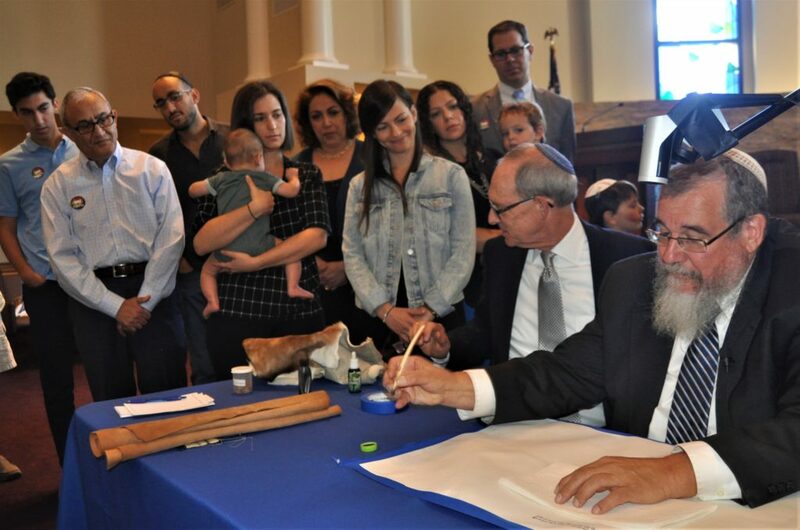 On Sept. 10 at Congregation Anshai Torah, noted Torah scribe (sofer) Rabbi Zerach Greenfield became the agent of the Weinberg, Kushnick and Bakhshian families to fulfill the mitzvah of writing Anshai Torah’s first Project 613 congregational Torah. “This week we read from the portion of Nitzavim-Vayeilech, in which we are given the 613th commandment, to write a Torah. The timing and the simcha is indeed a special moment for us all. For most of us, it’s a once-in-a-lifetime opportunity to see a Sefer Torah begun and for our whole community to participate,” said Rabbi Stefan Weinberg. 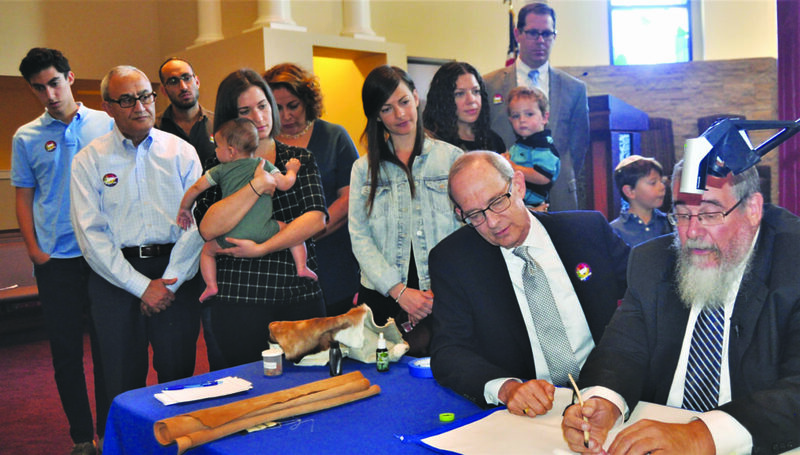 The husband of Wende Weinberg, of blessed memory, and the congregation’s leader, he sat with his daughters and five-month-old grandson while Rabbi Greenfield began filling in the letters of the scroll. “It’s a living document and will certainly continue our incredible legacy of thousands of years. Wende’s neshama is part of our own beresheet, our beginning. As Anshai Torah begins its 20th year, we’re committed to the obligation for this Torah to be written and it will be part of each of our souls. With the families of Rabbis Weinberg and Michael Kushnick, and Gabbai Farzin Bakhshian at the dais, Rabbi Greenfield began the first letters of Beresheet. Members of Anshai Torah’s a cappella choir, Kol Rina, set the tone singing Hashiveinu (Return Us), Torah–Torah–Torah, and Eitz Chayim (Tree of Life). Greenfield is the scribe of the United States Military clergy and has worked on 200 Torahs and other Judaica projects. He met with religious-school students, parents and the congregation-at-large, explaining the process and tools used to create a Torah before beginning his holy work. Project 613’s Torah is dedicated to the life and legacy of Wende Weinberg, Anshai Torah’s rebbetzin since its inception, a religious-school teacher and principal, and for 32 years teacher, Judaic studies and program coordinator at the Ann and Nate Levine Academy (previously Solomon Schechter Academy). She was always a role model. Her bachelor’s in developmental psychology provided her with the wisdom and deftness to touch young minds, hearts and souls — infusing them with her love, respect and admiration for Judaism. Her master’s degree in Jewish studies provided the depth needed to convey her message. Project 613 is coordinated by Co-chairs Mojgan and Farzin Bakhshian, Jaime and Michael Cohen, Pam and Jonathan Goldminz, Jeanette and Michael Pincus, Jay and Nicole Post and 72 other honorary co-chairs. The community is invited to share their respect for Wende, by donating $18 for a word, $180 for a sentence, $1800 for a sedra or parsha, or $18,000 for a complete book. Donations of $5,400 can be applied to one of many special sedrot corresponding to the birthdays (B’har/B’hukotai, Ekev, Naso, Vayikra) and b’nai mitzvah (Reeh, Shimini, Tzav, Vayeshev) of Adina, Danielle, Jordana (the Weinbergs’ daughters) and Wende; Wende and Rabbi Stefan Weinberg’s wedding anniversary (Ekev); and in honor of the birth of Ariel Zev Zubery, the Weinbergs’ first grandson (Tazria/Metzora). It takes the sofer about four hours each day to write just one column of 42 lines. With 245 columns, and 304,805 letters, it is a slow but precious and dedicated process. Rabbi Greenfield explained that the sofer follows another Torah as a guide for spacing and justification of the letters and words, purposefully leaving the word “God” out as he goes along, making that the first words each morning when his mind, hand and consciousness is most fresh. Heart and soul — and a bit of neshama — sounds familiar. Not unlike Wende Weinberg. A match made for the Anshai community, from heaven. For more information about Project 613, email project613@anshaiTorah.org or call Harvey Swento at 972-473-7718. Beloved Dallas educator Wende Weinberg died Dec. 4, after a courageous 18-month battle with lung cancer. She was 57. Weinberg was the heart and soul of Jewish education at Ann and Nate Levine Academy, formerly known as Solomon Schechter, for more that 30 years. She touched the lives of countless Levine students and their families, encouraging them to embrace Judaism. Teaching Jewish education was effortless for Weinberg; she made it look easy and her passion and love for her students was evident in her every endeavor. 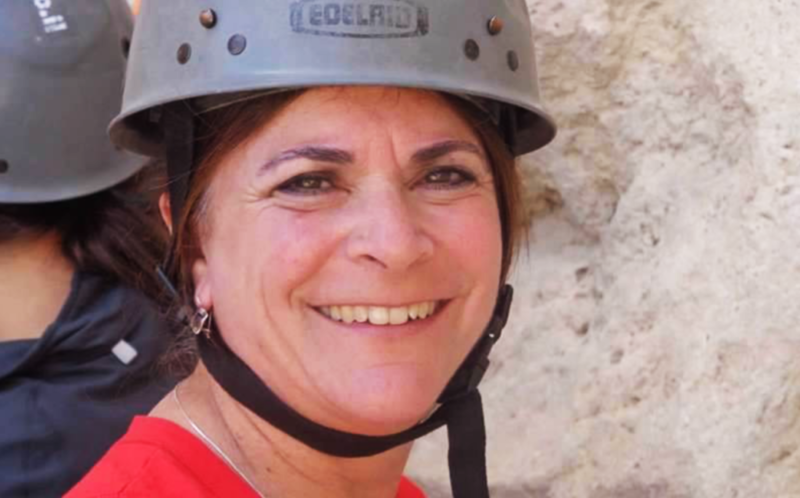 Among her myriad programs she implemented and sustained at Levine was the annual eighth-grade trip to Israel, an event of which she never tired. “Every year it’s a different ‘first’ because it’s the kids who make the trip. One child said ‘I’m in Jerusalem and I don’t know if I gave enough to my davening,’ or the time a windstorm stopped the cable cars on Masada and we couldn’t get right down and we huddled together in a cave. It’s when a young lady who was so emotional, again at Masada, and there happened to be a sofer (scribe) there who wrote her a bracha on a piece of parchment, he gave one to her and one to me — mine still a treasure. Israel is a fantastic place, but it’s not always the moments, but the moments within,” Wende reminisced in a Nov. 17 TJP profile. Next to her husband of 32 years, Rabbi Stefan Weinberg, the couple built Congregation Anshai Torah in Plano. The synagogue, started in 1998, now has more than 500 families. The sanctuary of Weinberg’s beloved shul was overflowing as mourners spilled into the hallways and sat on stairs in the balcony at her 2 p.m. funeral Tuesday, Dec. 6. Rabbi Michael Kushnick led the service. “Wende Weinberg was truly one of the most inspiring women I ever had the privilege to know,” Kushnick said. He explained that Wende nurtured him and his wife on the role of a rabbinic family. “Wende may no longer be with us, but her actions and accomplishments surround us. We must constantly strive to incorporate the values and lessons that Wende taught us. By doing so we will ensure that her memory continues to make our world a better place,” he added. Each of Weinberg’s daughters, Danielle, Jordana and Adina, spoke about the impact their mother had on them. “I have her fierce independence, her work ethic, her passion, her stubbornness, her perfectionism,” said Danielle, who added that her mother inspired her to be the best person she could be every day. “The mark of a true educator is to teach by example. She taught everyone around her by the way she lived her life; she was warm and she treated others with kindness, always had a smile on her face. A quality my sisters and I have all inherited,” Adina said. A teacher, like her mom, Jordana said her mother was her go-to person. Rabbi William Gershon delivered the main eulogy. “I was deeply honored and humbled when Wende asked me to deliver the eulogy at her funeral,” he said. “If the walls of this synagogue and of Levine Academy and so many other institutions of Jewish life in this community could weep, they would shed rivers of tears for Wende …. “This community and the Jewish people have lost a leader, a cherished teacher of Torah, a woman who touched the lives of literally hundreds if not thousands of Jewish souls. In addition, to her husband and daughters, Weinberg is survived by her son-in-law, Gilad Zubery; her brother, Bruce (Debbie); sister, Debbe (Barry); sisters-in-law, Laureen, Jacqui (Larry); brother-in-law Jefry (Alla); nephews and nieces — Matt, Lacey, Jason (Jillian), Michelle, Bryan (Melissa) and Josephine, Lauren and Angela; and many loving cousins and friends. Interment followed the service immediately at Congregation Anshai Torah Cemetery at Restland Memorial Park. A full obituary can be read on Page 23. 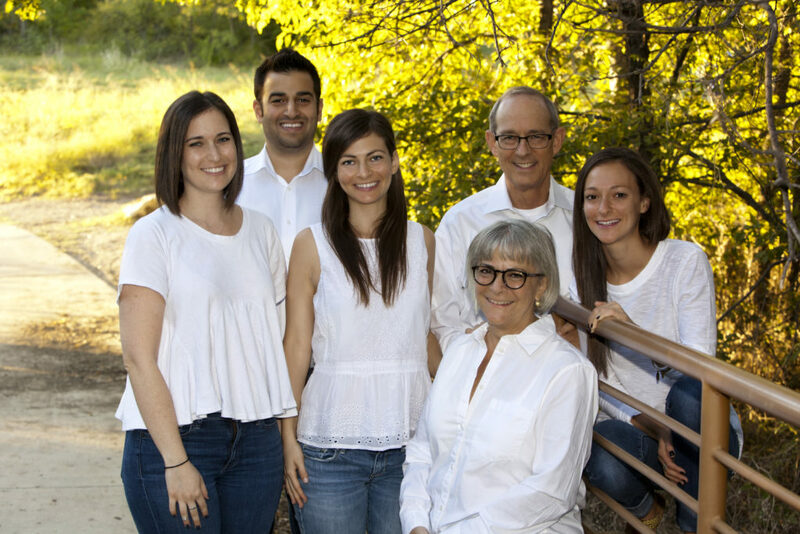 The Weinberg family has always stood behind each other, and when it comes to their wife and mother Wende – they couldn’t glow more. (left to right) Adina, Gilad and Danielle Zubery, Rabbi Stefan, Jordana and (seated) Wende Weinberg. Life is about the moments and if you look, you will find in each child when they ‘get it,’” said Wende Weinberg, Director of Jewish Studies and Programs at Levine Academy, a pillar at the school for more than 30 years. Shown, of her legions of Levine students, also here with Rabbi Michael Katzman, (from left to right) Abigail Khalameizer, Ella Frydman, Lauren Hazan, Avery Wren, Shayna Rubinstein, Jonathan Pershes, Joshua Saland and Aiden Mintskovsky. A woman of valor — a true aishet chayil — Wende Weinberg, who has taught Dallas-area children from the aleph-bet to the tying of the knots on a tallis, will be paid tribute at 6 p.m., Thursday, Dec. 15, at the Renaissance Dallas Richardson Hotel. A Philadelphia, Pennsylvania native who moved to Los Angeles as a toddler, Wende is the daughter of Kay and Marty Waterman, both of blessed memory, and the sister of Debbe and Bruce. A product of Los Angeles’ public school system, a graduate of Hamilton High School, she attended religious school at Temple Beth Am, her family’s congregation until she was 13. At a time when many children cease their formal Jewish instruction, she made the choice to continue her studies then at Sinai Temple and the LA Hebrew High School. With degrees from California State Northridge, in Early Childhood Education and Jewish Studies, Wende earned masters degrees from the University of Judaism in Day School Education and in school administration. There she met her b’shert, the future Rabbi Stefan Weinberg, when the two shared a halacha (Jewish laws) course. The couple married in 1982 and, while Rabbi Weinberg finished his degree at the Jewish Theological Seminary in New York, Wende taught kindergarten at the Solomon Schechter School of Westchester and religious school at Beth El New Rochelle. From 1984 to 1988 the couple first made Dallas their home, he an assistant rabbi at Congregation Shearith Israel and later as CSI’s Associate Rabbi from 1990 until 1998; she at Solomon Schechter Academy (now Levine Academy). During the interim (1998-1990), he served Temple Beth Zion in Royal Palm Beach, Florida, and Wende was that congregation’s religious school principal. In 1998, the couple became the founding rabbi and rebbetzin of Congregation Anshai Torah, growing the congregation from 125 member families, to its current 540. Partners always, they’re a team of strength personified. 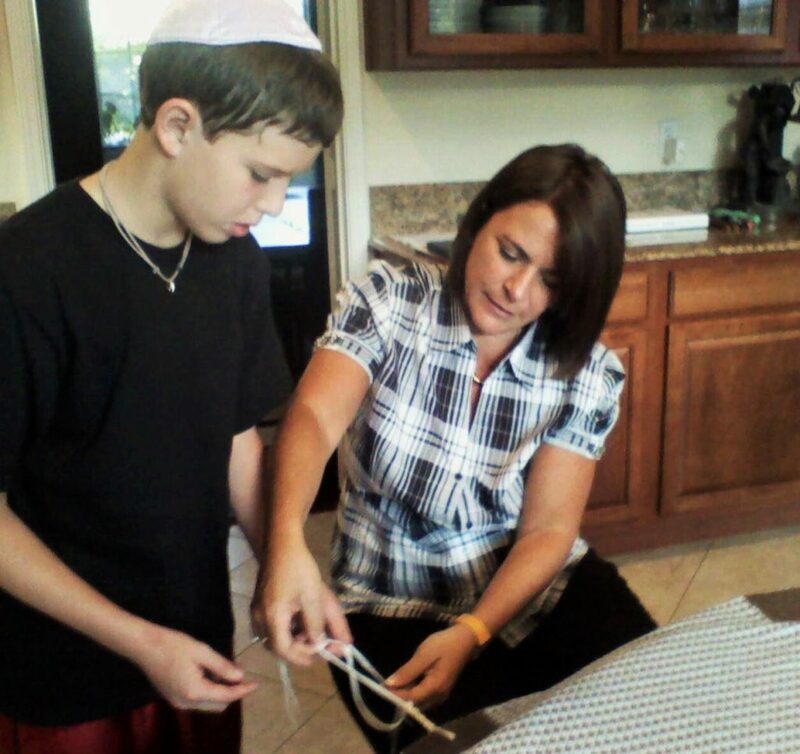 Wende Weinberg’s impact in the community comes from her roles at Levine Academy, Anshai Torah and touching students – one to one — here in 2010, helping Jonah Silverthorn learn to tie the knots — in fact, tying him forever to Jewish tradition — as together they created his own tallit. Rabbi Weinberg says the way she engages and is patient is the same as when the couple began. In 1984 Wende was hired by Rabbi Ed Feinstein, an assistant rabbi at CSI and Solomon Shechter Academy’s founding director, to teach first and third grades, and shortly thereafter to lead the Judaic Studies department. She has, but for the two years the Weinbergs were in Florida, given Dallas her all. Among the imprints Wende has made are the hundreds of eighth-grade students she has taken to Israel since 2004, always reflecting on her own first visit, in 1973 through the Los Angeles Bureau of Jewish Education’s Summer Ulpan program — then, nearly the same age as her own charges. “Every year it’s a different ‘first’ because it’s the kids who make the trip. One child said ‘I’m in Jerusalem and I don’t know if I gave enough to my davening,’ or the time a windstorm stopped the cable cars on Masada and we couldn’t get right down and we huddled together in a cave. It’s when a young lady who was so emotional, again at Masada, and there happened to be a sofer (scribe) there who wrote her a bracha on a piece of parchment, he gave one to her and one to me – mine still a treasure. Israel is a fantastic place, but it’s not always the moments, but the moments within,” reminisces Wende. Wende smiles at the memory of her first Schechter trip to Israel when one student, born in South Africa, and she were delayed on the way home because his paperwork – which got him into the country, wasn’t deemed acceptable for his return. “I sent the group home and, because it was just before Shabbat we stayed the weekend while his parents couriered to Israel the necessary papers. For him, it was an adventure. Extra time at the beach and museums — it was for me too — one of the best moments. Life is about the moments and how you manage them,” she said. Despite battling cancer since June 2015, Wende — never one to miss teachable moments, or a trip to Israel, led last year’s eighth-grade trip. That connection is fueled by her passion — a word used to describe Wende by everyone interviewed for this story — a word that hasn’t wavered for one moment. The Wende Weinberg Endowment Fund for Jewish Education will serve as an ongoing tribute to her extraordinary dedication, ensuring that children experience the richness of Levine Academy’s Day School Education. From Israel study and holiday celebrations to ensuring that children are taught by the most highly skilled and qualified educators, every donation to the fund will continue Wende’s commitment to children for generations to come. Donations made before Dec. 5 will be recognized in the tribute evening’s program. Among the greatest of honors is the respect children have for their parents. It is mirrored and apparent in her own three daughters, Danielle, Jordana and Adina. The event committee is producing a tribute book, co-chaired by Stacy Barnett and Lauren Busch and the community-at-large is asked to share memories, sentiments of love and gratitude – in the form of prose, letters, photos or artwork, all of which will be reproduced in a hard-bound book with copies given just to Wende and her family. There is no charge to submit messages, which should be emailed in JPG, word.doc, or in the base of an email message to tributestowende@gmail.com no later than Monday, Nov. 21. Dinner reservations are $180/ticket with $54/tickets available to Solomon Schechter Academy/Levine Academy alumni under the age of 30 and current students. To RSVP, to donate to the Wende Weinberg Endowment Fund, or for more information visit http://bit.ly/2fRzQ2Y or email mgendason@levineacademy.org. Wende has blogged extensively about her journey on CaringBridge.org. Her blog is available after signing up for the site at www.caringbridge.org/visit/wendeweinberg. Dallas’ own Jacob Herstein is taking Queen’s musical message of “I want to ride my bicycle” very personally. Soon, he’ll be riding 4,500 miles between Austin and Anchorage as a member of the 2018 Texas 4000 team. 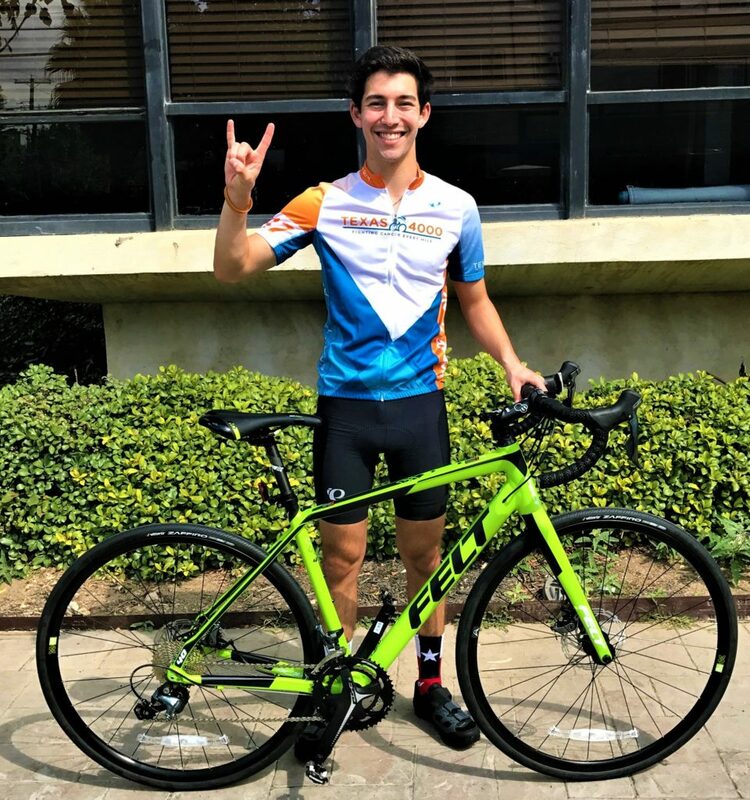 Dallas’ Jacob Herstein is raising money for his 2018 bike ride, 4,500 miles between Austin and Anchorage, for the fight against cancer. Since its founding in 2004, Texas 4000 has raised several millions of dollars, which has funded cancer research projects at MD Anderson Cancer Center, the UT Biomedical Engineering Department and more. Herstein is a biology and pre-med junior at UT-Austin. The issue he’s hoping to solve may likely be one he’s raising money for. Herstein has raised more than $5,800 in tax-deductible pledges, hoping to surpass $7,500. The students coordinate the rides with room and meals provided by a mix of host families, nights camping in tents and community centers. It’s rugged and rough, but previous hometown riders Elan Kogutt, in 2015 and Charlie Saginaw in 2010 wouldn’t trade the experience. Kogutt rode in memory of Margot Pulitzer, her children his lifetime friends, with the hope that no others would share the effects of loss and their pain. For Saginaw, the connection is truly lasting. Last May, seven years after his ride, he married the former Rachel Brenner, who rode in 2011 following Saginaw’s advice to smile through the toughest trails. Herstein’s route traverses the southwest through West Texas, New Mexico, Arizona, Utah and Nevada then north through the California, Oregon, and Washington coasts and into Bristish Columbia and the Yukon before reaching Alaska. They’ll stop at hospitals presenting money raised by the previous year’s riders. After they’ve seen the impact the ride provides, they will return to determine where their funds will be distributed by the 2019 riders. Recently making his first ride on his bike, Herstein said it was uplifting and he truly got a sense of what it means to ride for those battling cancer. Riding for this cause, and participating in many forms of service through the years, is an example set by Herstein’s parents, Bertta and Scott, and his sister Jillian, who look forward to meeting him for the final stretch of the ride. He is a member of Congregation Beth Torah and a graduate of Levine and Yavneh academies. Mitzvah projects are something he’s known all of his life. It’s how he lives. “That Jacob decided to dedicate his journey in memory of my father and so many who lost their lives to cancer makes it even more meaningful,” said Bertta, recalling her son on his trike which had a storage compartment filled with action figures. The Texas 4000 brings Herstein’s leadership skills to a new level. He’s learning about running a nonprofit and its logistics from inception. His resume on paper, and in his heart, is filled with entries. He is president of the UT chapter of Sigma Alpha Mu fraternity and a member of UT’s Texas Cowboys service organization. In high school, he was a member of BBYO’s Brandeis Chapter, and a Judaic Teaching Intern at Yavneh teaching an Oral Law class related to Jewish holidays and customs. To support Herstein, or learn more about the Texas 4000, visit http://bit.ly/2hcC4ZF. One afternoon, before the first cold spell struck, I was struck by how beautiful so many trees looked this year. The reds and yellows were unusually dazzling for North Texas, and I enjoyed them as much as I did the annual vibrant displays during all the years when I lived much farther north. But I realized, as I always did in earlier times, that this beauty is just a prelude to annual “death”: Colors fade, leaves fall and trees — plus much else — shut down for the winter. This year has been a sad time in our Jewish community. Many have left us, including Jean Fagadau, a National Council of Jewish Women stalwart; Hank Meltzer, a past president of Tiferet Israel; and Wende Weinberg, the heart and soul of Levine Academy for so many years, whose illness claimed her even as many were readying for the major tribute dinner in her honor. Thinking these things made me appreciate the fine information sheet prepared by VITAS Healthcare, which I found during my regular monthly “story time” visit to what was — until recently — The Legacy Preston Hollow, now sold in anticipation of our Federation’s forthcoming Legacy Midtown Park. I continue going to the now-renamed senior facility to share memories and discussion with the Jewish residents remaining there. But the attractive information sheets I found deal with “Loss and the Holiday Season,” appropriate for people of all ages and all religions, or none. Since sharing should always be the essence of happy holidays, VITAS advises that it’s not only possible, but truly important, to “share the joy, love and happiness while honoring the past and your loss.” Yet while some people can still find comfort in old rituals at such times, others may experience them as unbearably painful; in these cases, it’s fine to initiate new ways of marking holidays, to create new traditions that can also encompass and celebrate the past. VITAS provides a list of suggestions for such new, post-loss “traditions,” ranging from enjoying the foods and fun that your late loved ones always loved, to setting an extra place at your table in honor of a special person recently gone. The basic idea is not to give up entirely either the grieving or the celebration, but to find comfortable ways to meld them, to move personal life forward after a loved one’s death. Personal testimony: I have done this myself, successfully, since my own husband passed away. If you would like a copy of this excellent advice, call VITAS at 214-424-5600. Even if it’s not needed now, it will help everyone when our inevitable leaves fall in the future. If your own children or those of friends or family have attended Ann and Nate Levine Academy at some point over the last three decades, you have no doubt had an encounter with Wende Weinberg, the school’s director of Jewish Studies. I have always thought of Wende as the “Energizer Bunny” — constantly moving and making sure that all of Levine’s many programs, special events and trips go off smoothly and without a hitch. My own three kids have benefited from her wisdom, energy and general menschlichkeit over the 13 years we were at the school. 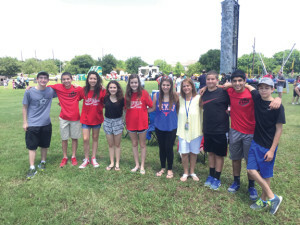 So, Friday, May 29, when Levine Academy’s Class of 2015 celebrated its final Shabbat at the school, the usually ebullient year-end mood was somewhat subdued given the medical news handed to their beloved Wende just the day before. Most Levine students have known Wende their entire lives — either from school or as congregants of Anshai Torah, where Wende’s husband Stefan serves as rabbi. 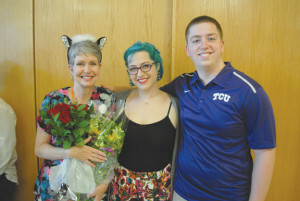 Once Wende shared her diagnosis of lung cancer, the graduating class whom she had bonded with during their entire time at Levine and their most recent March trip to Israel quickly jumped into action, much as Wende has modeled for them over the years. All they had learned about giving back and doing for others kicked in and Ben Levkovich, Matthew Stevens and Sarah Kleyman approached the administration about holding a fundraiser at the already planned Parent Association Summer Send-Off and Blood Drive for Bennett Towbin that was being held on Sunday, May 31. Inspired by Wende and with the help of parent Carole Stevens, the eighth-grade class put together a lemonade stand to collect funds to be earmarked for lung cancer medical research, raising more than $225. Yasher Koach to all the students involved! As Wende goes through further testing to determine the best course of treatment, our hearts, prayers, love and support go out to her and her family — Stefan, Danielle, Jordana and Adina — as we pray for a refuah shlemah, a complete healing for Wende! If you are heading to Las Vegas this summer, you can catch the musical spectacular BAZ at the Mandalay Bay on Wednesday through Monday nights starting June 19. Olivia Harris, daughter of Holly Kuper and the late Hugh Harris, will appear in the 90-minute show throughout the summer. Olivia is a graduate of Akiba Academy and Booker T. Washington High School for the Performing and Visual Arts in Dallas as well as Carnegie Mellon University in Pittsburgh. In 2012, Harris had a feature role in The Playroom, a film about a 1970s family fraught with family dysfunction. The film was featured at Videofest 25 in September 2012 in Dallas. In a TJP profile of Harris in August 2012, Harris’ mother Holly Kuper said, “We’d sing in the car, before bedtime, during family vacation car rides. Kuper, a photographer, was always intent on sharing the beauty of many forms of art with her daughter. “Since Olivia was little, she’s devoted herself to whatever matters to her. A science project was never ‘just’ an assignment, but always filled with design, learning and depth. Everything she does is that way. She’s not interested in the fame or the reviews,” Kuper said. Dr. Marshal Goldberg was installed as the president of the Dallas County Dental Society on Thursday, May 21, 2015 at a gala event at the Park Cities Hilton. 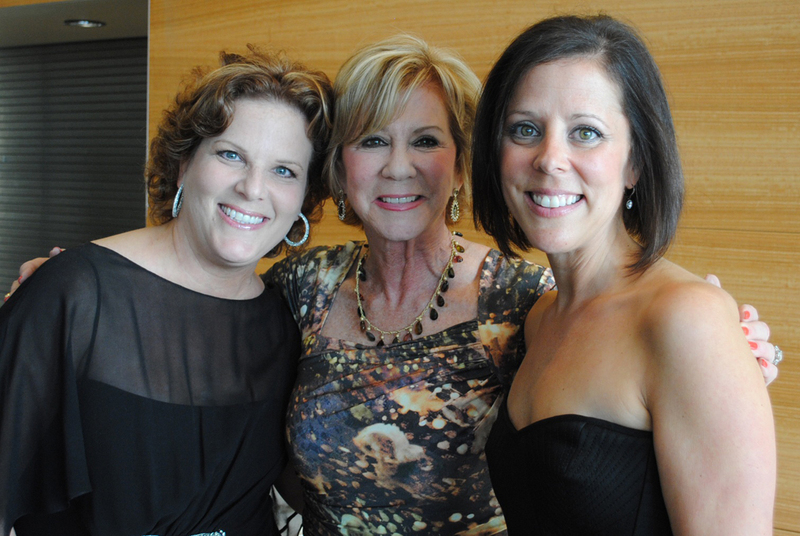 Dallas County Dental Society represents over 1,100 dentists in the Metroplex. Dr. Goldberg, a specialist in periodontics and dental implants, with an office in North Dallas, has been in practice for 25 years. He and his wife, Cyndi Heller, have been married almost 30 years and they have two beautiful children, Josh and Jenna Goldberg. Congratulations to Dr. Goldberg! Mazal tov to Blake Silverthorn, who just graduated from Texas Tech University with a BA in media strategies. Blake started May 26 as an associate producer with the Dallas Cowboys. He is cofounder and a three-year producer/director of Texas Tech’s Double T Insider, which he sold to FOX Sports Southwest. Blake was an intern at the Cowboys since he was just 13. Blake is the son of Deb and Eric Silverthorn of Plano. Kathi Sebastian (née Ravkind) has joined the Retina Foundation of the Southwest at its major gift director. Her role is to help find a cure for age-related macular degeneration by seeking support from donors to invest in the amazing research being done at the Foundation. Mazal Tov to Kathi on this position and her recent marriage to Don Sebastian April 19. Kathleen Hoffman, teacher in the Weinreb Early Childhood Center infant class, was honored with the 2015 Sadie and William Waldman Teacher Excellence Award at Levine Academy. This award, established in 1988, recognizes teachers who exhibit a commitment to the school, a passion for education and a love of learning! I learned earlier this week that Janine Pulman’s last day at Jewish Family Service was yesterday, May 9, after 22 amazing years. Janine has been the volunteer coordinator there and I’m sure has interacted with many of you as she has with my family from planning JFS centerpieces for your simchas to coordinating your volunteer efforts. A new staff person has not been hired yet, so for any questions that you had directed to Janine in the past, those can go to Cheryl Stein at 972-437-9950 or cstein@jfsdallas.org and she will direct you to the right person. Janine has been a tireless worker for our community and I know she is going to enjoy planning the August wedding of her oldest daughter, Alecia, and spending time with husband Charles and daughter Jodi. State Sen. Florence Shapiro, R-Plano, was honored for her commitment to achieving excellence in education during Ann and Nate Levine Academy’s annual gala April 29 at the Westin Galleria Dallas. The event, which was attended by 420 people, raised more than $300,000 for the school from sponsors and a silent auction. Levine Academy’s gala also recognized the following teachers, administrators and staff for 25 or more years of service: Beverley Lewin, Sandra Cantor, Wende Weinberg, Deborah Lan, Shirley Green-King, Kathryn Hill, Estella Raphael, Nonie Schwartz and Betty Kenner. Fred and Kay Zeidman and Frank and Helen Risch served as honorary chairs for the event, while co-chairs Dana Eisenberg and Carrie Sternberg, along with auction chair Nina Goodman. made sure everyone had a wonderful time. Dallas musicians Joel Alhadef and Rick Devincent of RickyJoel have recently added another music video to YouTube. It’s an old Rolling Stones cover called “Dead Flowers” and can be viewed at www.youtube.com/watch?v=hRtfsTZOPEM or by entering “RickyJoel, ‘Dead Flowers” in the search engine. Incidentally, their first video, “How’s Your Life Today,” which was released about one year ago this month, is approaching 3,000 views. The song was also the featured backdrop music for the Jewish Federation of Greater Dallas’ Women’s Event campaign video. That very moving video can be seen on YouTube as well. JFS was honored with the Pam Blumenthal Community Service Award from the Dallas Psychological Association Sunday. This award was created following the untimely death of Pam Blumenthal, an outstanding young psychologist and mental-health advocate. Criteria for this award include serving as a local DFW person/organization/program dedicated to the welfare of children, families, or the community as a whole; serving underserved/most vulnerable populations; promotion of the profession of psychology through work/programs; and working to promote the best interest of people in Texas. Mazel tov to JFS on receiving such a distinguished award from this professional community organization. The Legacy at Preston Hollow has received a deficiency-free healthcare inspection rating for the second year in a row from the Texas Department of Aging and Disabilities Services. In achieving this exceptional rating, the community has reached a milestone in continuing the 60-year legacy of exemplary care. The inspection process lasted four days and included a team of surveyors from the Texas Department of Aging and Disabilities Services. The full continuum of nursing care was inspected, including: dining services, laundry services, environmental aspects, administrative practices and human resources. Interviews were also conducted with residents, their family members and team members. According to the Texas Department of Aging and Disabilities Services, the average nursing home is cited with seven deficiencies. The Legacy at Preston Hollow has deep roots in the community dating to its beginning as The Dallas Home for the Jewish Aged, a non-profit that opened in 1953 and has continuously served seniors and the Jewish community since its inception. The original home was located on the Golden Acres Campus and transitioned to its new location in August 2007. After an extensive renovation to the existing community, the name was changed to the Legacy at Preston Hollow to reflect its corporate ownership and their standard for service, amenities and the quality of care. Dr. Mark Fleischer is the medical director of the Legacy Preston Hollow. 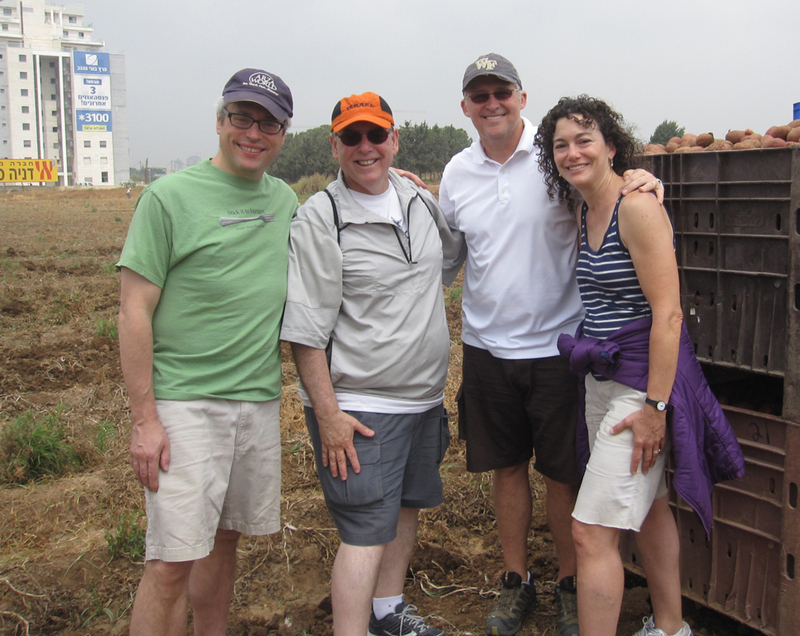 Recently, as part of the interfaith mission to Israel, Dallas’ Temple Emanu-El and Wilshire Baptist Church spent a morning picking potatoes for distribution to Israel’s needy with Leket Israel-The National Food Bank. From left, Rabbi David Stern, senior rabbi at Temple Emanu-El; Brad Sham, Dallas Cowboys radio play-by-play announcer; George Mason, senior pastor at Wilshire Baptist Church; and Rabbi Nancy Kasten, Stern’s wide, recently picked potatoes during an Interfaith mission to Israel. The Temple Emanu-El and Wilshire Baptists Church trip picked 6,000 pounds of potatoes that will help feed 800 families in need. Serving as Israel’s leading food rescue network, Leket Israel (www.leket.org) reclaims food from hundreds of food suppliers (restaurants, catering halls, farms…) and delivers it to over 300 nonprofit organizations serving Israel’s needy; feeding 60,000+ people daily.